After Pope Julius II (Della Rovere) (1503-1513) founded the Pontifical Swiss Guard at Rome in 1506, other little units of Swiss Guards were established in some towns of the Papal States, among which were Bologna, Ferrara, Ravenna, Pesaro and Urbino. Pope Julius II established a little detachment at Bologna in 1507. The military and administrative ambit of the Pontifical Swiss Guard was generally distinct from these little units’ one. The Corps serving at the Vatican was under the authority of the Holy Father and in charge of the safety of His Person and His Residences in Rome and in the Papal States. These other little units of Swiss Guards were under the authority of a Cardinal known as “Cardinale Legato” who was the local Pontifical governor in the provinces – the so-called “Legazioni” – of the Papal States. These little units were basically responsible for his safety over a limited territory. The Swiss Guard Archives in Rome keep no records, registers, personal and service data about Guards of such units. 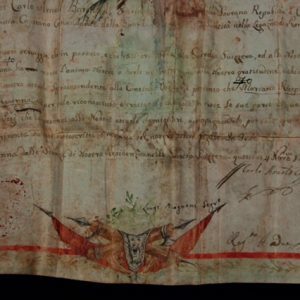 A comprehensive, detailed historical research has never been carried out in either Italian or Swiss archives in order to study their specific duties, regulations, full strengths, uniforms, weapons, and daily life in the course of the centuries. As a result, scanty information on the subject is currently available to researchers and scholars. In other words, the history of these units is basically unknown. So what we have here is a document that contains an element of mystery given the fact that its history has never been kept. 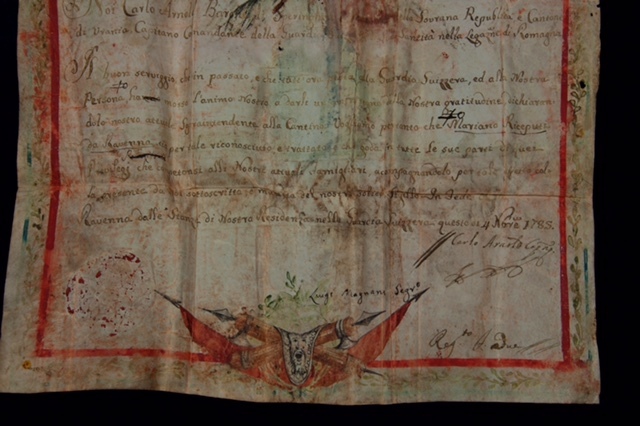 The document is well preserved and in nearly perfect condition, given its great age. The illuminations are ornate and detailed, containing, among other things, a Swiss Guard within the larger picture at the top. 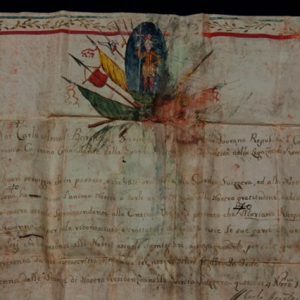 It is an interesting depiction of a document presented to a guardsman who is being honored for his service in one of these smaller assignments not directly devoted to the protection of the pope who was Pius VI at this particular time. 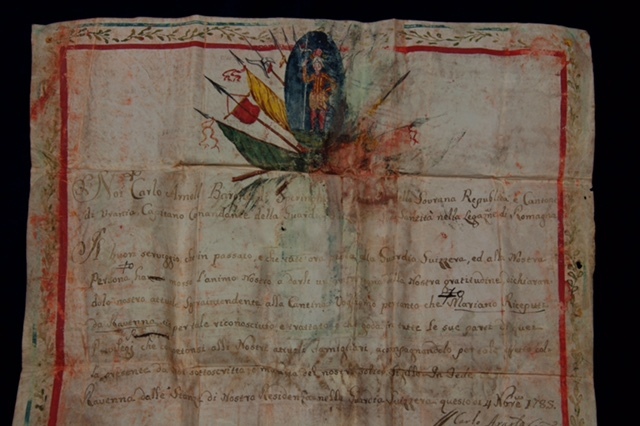 FROM the ROOMS of OUR RESIDENCE in the SWISS GUARDS: 4 November 1785. 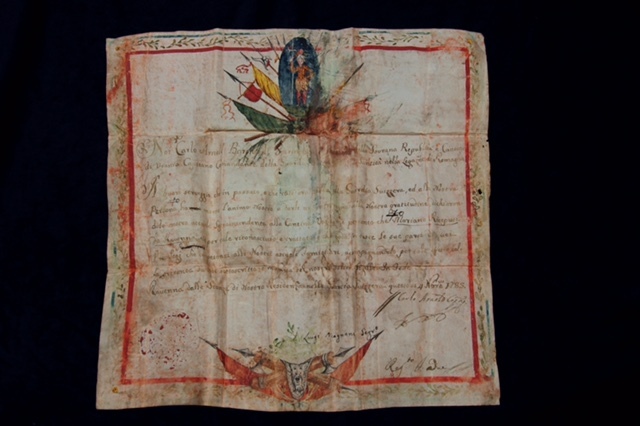 It contains a concession of privileges for someone who has given exceptional service in the Papal State of Ravenna. 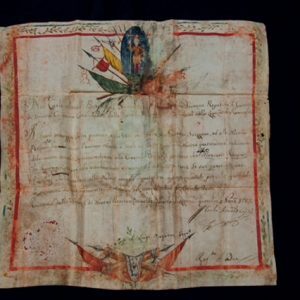 Since no information about these smaller units has been kept in the Swiss Guard archives at the Vatican, this document remains mysterious and possibly rare, and, as such, is a great addition to the Collection as a whole and to the Swiss Guard in particular.